Understanding the intricate and enduring nature of this crisis, Mr. Ulukaya signed the “Giving Pledge” in 2015, committing to give away most of his personal wealth over his lifetime to assist refugees. His commitment to refugees extends to his own business, which employs hundreds of resettled refugees and empowers them and their families to succeed. Sitting on the boards of the Special Olympics and the Pathfinder Village, he is a testament to living one’s life in service of others. 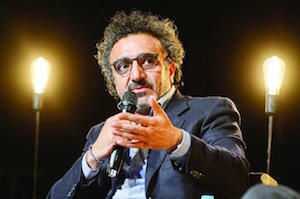 “Like Kahlil Gibran, Hamdi Ulukaya is an immigrant who chose to make America his home and we are all the beneficiaries. Whether it be refugees, his own employees or the disability community, Hamdi has chosen to put the success and well-being of others first. His seemingly endless love for humanity and belief that businesses can change the world for the better, has impacted the lives of countless individuals, and made our world a better place. For lifting so many and for acting as a living example of how to empower those around us, we are proud to honor Hamdi with the 2017 Gibran Award for Individual Achievement,” said AAIF Foundation Director Maya Berry. The Kahlil Gibran “Spirit of Humanity” Awards was launched in 1999 to recognize individuals, corporations, organizations and communities whose work, commitment and support make a difference in promoting coexistence and inclusion in all walks of life. The awards are named for the author of The Prophet, whose message of human endurance and triumph was so evident in his life and work. The awards further symbolize Gibran’s pride in his Arab heritage, respect for the freedom he found in the United States and his universal love of humanity.